"I love colour, and lots of it. Living on the northwest coast I have had my fill of grey skies, cool blues and an over abundance of soggy greens. I decided very early to saturate my canvases with pure brilliant pigment. Orange, mauve or red skies descend over purple shadowed trees and chartreuse grasses. I am constantly pushing myself to take bigger colour risks while still maintaining a “readable’ landscape. Each painting contains an emotion that I am trying to convey, largely through the use of colour- how hot that day was, how cool the shadows were and how richly coloured the wildflowers were. All manner of roads, trails and paths, quirky buildings and the occasional dog intrigue me. On a grey day I enjoy buying a big bouquet of flowers, both for painting and filling up my studio. A successful painting is one where I captured the mood and shared the emotion. I wish for them to be arresting and yet restful. Alone and in front of the easel, I try to “get out of the way”, that is, step aside and let the colour just spill out onto the canvas in big juicy brushstrokes." 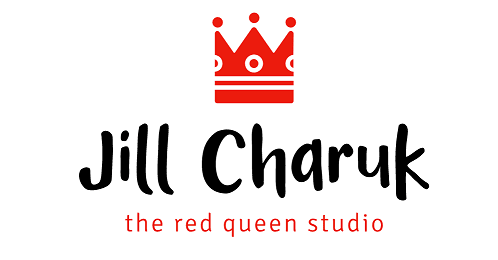 Jill Charuk's work is held in private and corporate collections in North America and Europe. Her work has garnered many awards and praise for her strong and vibrant use of colour. I love colour, and lots of it. SAVE 10%ON YOUR FIRST ORDER! Enter your email below and we'll email you a 10%OFF Coupon right now! Sorry, in order for compliance with regulations of GDPR I need you to accept cookies to view my site. Thank you.